Ardipithecus ramidus, called commonly as Ardi, lived in the Eastern Africa about 4,4, million years ago. It was described as a new species to science in 1994. The type specimen that became named as Ardi was one particularly well preserved skeleton, which description was published in 2009. Based on the structure of the discovered bones, the scientists deduced that Ardi was one of the first members of the human lineage, who was able to walk up-right on two feet. This species is very interesting also because it is very close to that developmental stage where the lineages leading to chimpanzees, and to the modern humans separated from each other. Development of the up-right bipedal walking still involves many unsolved questions. 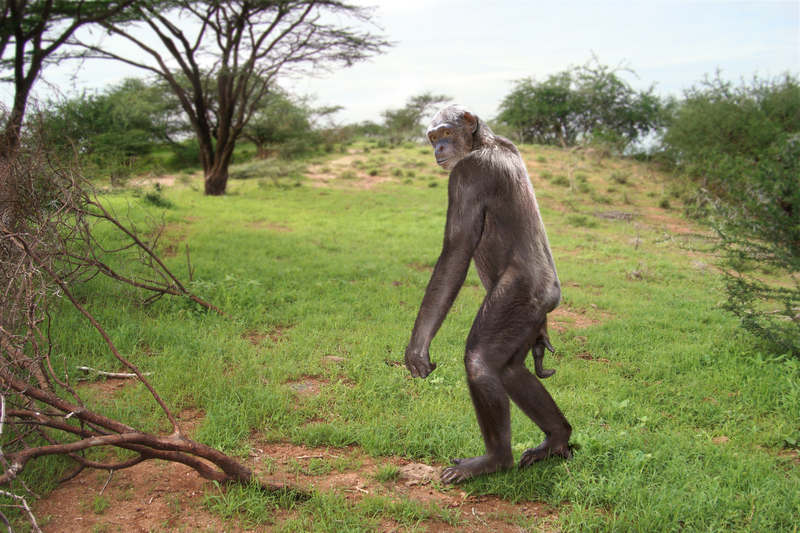 Humans are the only primate species who can walk for long times up-right, with extended knees. Chimpanzees and gorillas can walk, to some extent, but only in a quite cumbersome way, with bent knees and back hunched. In the fossils, the features that are associated with the bipedal walking are, for instance, long hind legs, rounding of the pelvis, the arching, rounded foot that is supported by the strong heel bone from the behind, and the structure of the toes. Walking up-right has very clear energy-economic benefits: a human walking on two feet uses only about half of the energy in movement as compared to the ape of the same size, walking on all fours. In the strong sun shine on the savannah, the one who walks up-right receives less radiation than those who walk on four legs. Maybe the largest benefit gained from the upright walking is still related to the bearing of different loads. Bearing of helpless offspring over long distances, or hauling of large amounts of food into the home gave is easier and more efficient for those who walk upright. Of course, another very important benefit from the bipedal walking is that it freed the hands for other tasks, such as the preparing and using of tools. Pliocene epoch 5.3 – 2.6 million years ago started, when the water way between Mediterranean Sea basin and Atlantic opened again through Gibraltar, and the Mediterranean basin was filled by water flooding as a great stream from Atlantic Ocean. This rapid ecosystem change can be seen in the geological formations in the area, e.g. in Sicilia. Also opening of the Beringer straight between North-America and Eurasia during the Plicene allowed the sea-fauna to migrate between the Pacific and the Arctic Ocean. Climate was still cooling, even temperatures were still warmer than today. Steppes, deserts, coniferous forests and tundra was expanding. Hominin evolution took important steps at Africa during Pliocene, when numerous Australopithecus and Paranthropus hominin species evolved. Other animal species during the epoch included also giant sloth and horned rodents at America, three toed horse Hipparion at Europe and various saber tooth cats and elephant related animals. At the end of epoch the Panaman isthmus formed, which had major impact both on American fauna and to the global climate.